Possible earthquake swarm: 22 earthquakes occurred near (under) the volcano during 22 hours, the last being recorded quake 55 minutes ago. Hypocenter depths ranged between 6.4 and 0.5 km. 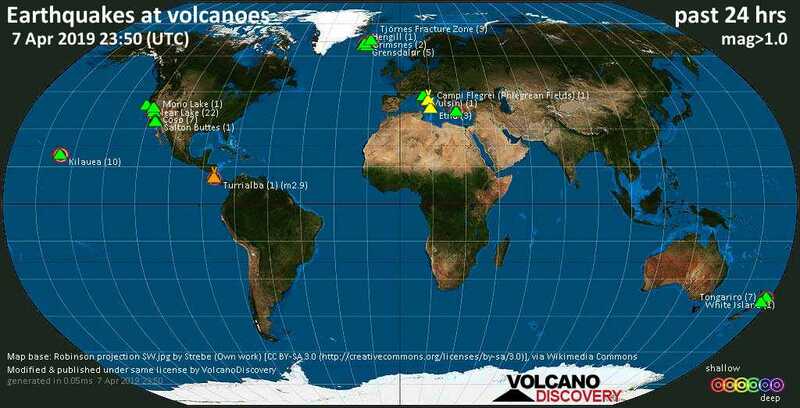 7 earthquakes occurred near (under) the volcano during 1 hour 26 minutes, the last being recorded quake 4 hours ago. Hypocenter depths ranged between 3.1 and 0.2 km. 10 earthquakes occurred near (under) the volcano during 23 hours, the last being recorded quake 37 minutes ago. Hypocenter depths ranged between 11.5 and 0.1 km. 5 earthquakes occurred near (under) the volcano during 39 minutes, the last being recorded quake 22 hours ago. Hypocenter depths ranged between 6.4 and 1.6 km. 3 earthquakes occurred near (under) the volcano during 1 hour 33 minutes, the last being recorded quake 8 hours ago. Hypocenter depths ranged between 8.6 and 7.1 km. A magnitude 2.9 earthquake occurred at the volcano 12 hours ago. The quake, which might be volcanic in origin, was located at a depth of 3.0 km depth at 10 km distance N from the volcano. A magnitude 2.2 earthquake occurred at the volcano 5 hours ago. The quake, which might be volcanic in origin, was located at a depth of 4.3 km depth at 6 km distance E from the volcano.